Play the classic Cribbage Card Game online. Start the game by selecting your skill level from an easy starter all the way up to a crazy hard ninja level. The objective in Cribbage card game is to be the first player to score 121 points. The classic card game Cribbage also known as Crib, Cribble, and Noddy. A card game traditionally for two players, that involves playing and grouping cards in combinations which gain points. 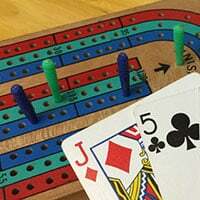 Cribbage has several distinctive features. The cribbage board used for score keeping, the crib, box, or kitty, a separate hand counting for the dealer. Two distinct scoring stages (the play and the show), aces low. And a unique scoring system including points for groups of cards that total fifteen (15). So are you ready to skunk your family in one of the most popular card games created in the 17th century? The rules of Cribbage are built in making it easy to learn how to play Cribbage / Cribble a become a pro. So enjoy and have fun.